Chabad on Campus International was presented with the Richard J.H. Gottheil Award, alongside Hillel International, from the Zeta Beta Tau (ZBT) fraternity on Saturday night at the Westin Bonaventure Hotel in Los Angeles. The award is presented to individuals or groups “that have advanced human understanding among all people.” Previous award winners have included the Southern Poverty Law Center, Doctors Without Borders, Jewish Federations of North America, the Anti-Defamation League and President Franklin D. Roosevelt. Chabad was selected because of its work in strengthening Jewish student identity at more than 500 campuses around the world and providing a non-judgmental space for Jewish students. According to the award citation, “Chabad has been chosen for this award for the remarkable work that has been done in providing Jewish students on college and university campuses around the world a place to call home. A place where they feel safe. 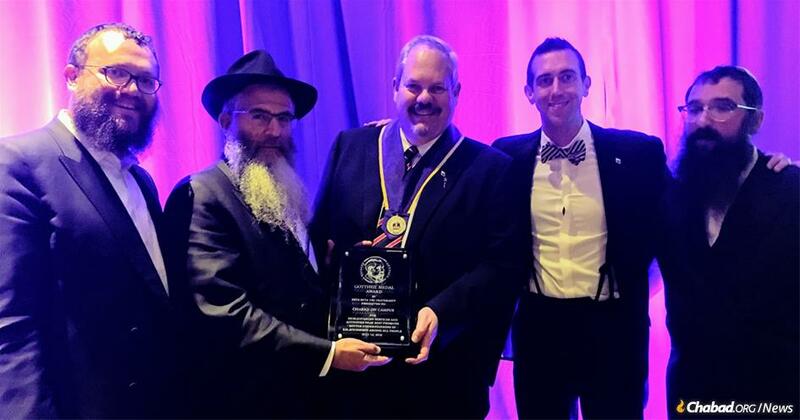 Rabbi Yossy Gordon, executive vice president of Chabad on Campus International, accepted the award on behalf of its 264 campus centers that serve more than 500 university and college campuses worldwide. 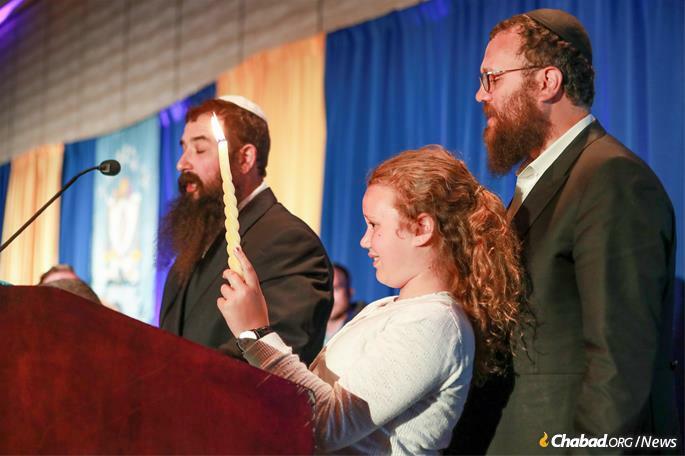 Rabbi Mendy Fellig, director of Chabad at the University of Miami, has been a central figure behind the growing bond between Chabad and ZBT. 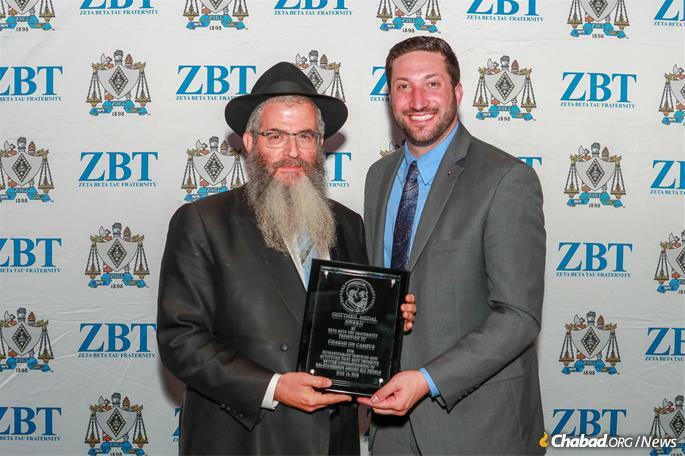 Over the past 18 years, he has increased his programming with ZBT to include Purim parties, Menorah lightings, Shabbat services, study sessions and more. More than a decade ago, Fellig was made an honorary brother by ZBT’s Miami chapter. ZBT was founded in 1898 as the first Jewish campus fraternity and retains a strong link to its Jewish roots. Famous ZBT brothers include composer Leonard Bernstein, director Harold Ramis, Israel’s ambassador to the United States Ron Dermer and basketball player Tal Brody. Also joining the Convention were Rabbi Dovid and Goldie Tiechtel of Chabad at University of Illinois at Urbana-Champaign, another couple who have been instrumental in fostering the partnership between the two organizations. The Tiechtels and Fellig directed the Shabbat program at the convention, which included meals, services, a “Stump the Rabbi” session and a Havdalah ceremony.